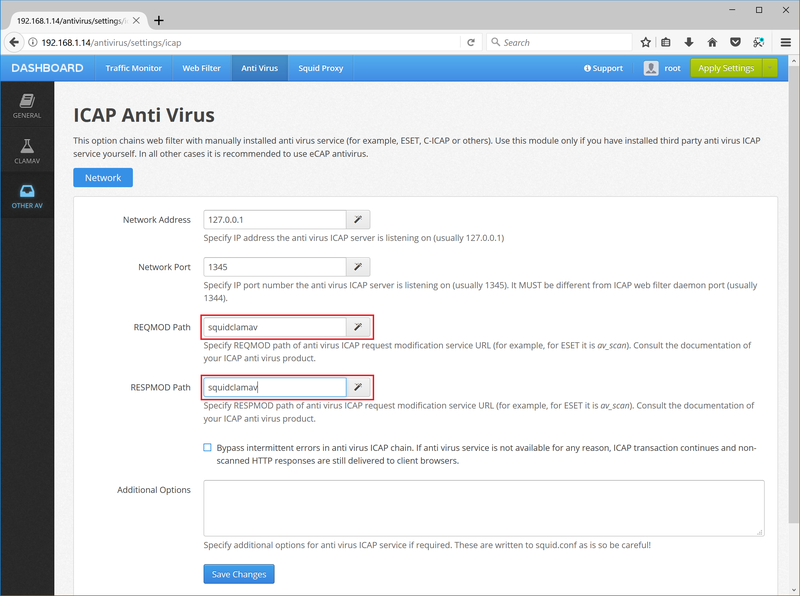 The following steps show how to install and chain SquidClamAV ICAP anti virus with Web Safety ICAP web filter. All instructions are run on virtual appliance for VMware vSphere/ESXi from our site. SquidClamav is an antivirus for Squid proxy based on the Awards winnings ClamAv anti-virus toolkit. Using it will help you securing your home or enterprise network web traffic. SquidClamav is the most efficient Squid Redirector and ICAP service antivirus tool for HTTP traffic available for free, it is written in C and can handle thousand of connections. The way to add more securing on your network for free is at http://squidclamav.darold.net. Thanks a lot to Gilles Darold - SquidClamav developer and maintainer! In order to install all necessary packages run script 01_install.sh from this archive. Contents of this script are shown below. Scripts are also available from https://github.com/diladele/websafety-virtual-appliance/tree/release-5.0.0/scripts.clamav repository. echo SUCCESS: squidclamav module is built and installed successfully! echo SUCCESS: now run 02_configure.sh script to perform initial configuration. Now configure all services by running script 02_configure.sh from this archive. Contents of this script are shown below. echo SUCCESS: squidclamav module is configured successfully! There are three patches mentioned in the above scripts. All of them are to be found in this archive. The patches make minor changes to configuration files of c-icap, squidclamav and clamav-daemon. Finally to integrate SquidClamav and Web Safety into one ICAP chain, navigate to Admin UI / Squid Proxy / ICAP / Integration and check the Chain web filter with manually installed Anti-Virus service checkbox as indicated on the screenshot below. Do not forget to click Save and Restart from Admin UI.